Originally known as Brown’s Falls, Minnehaha Falls became famous in the mid nineteenth-century. 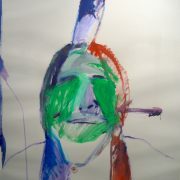 Inspired by the poetry and art of the first explorers to Minnesota, artists from the east toured the Mississippi River. It acquired national, even world, fame thanks to the recommendation in 1835 by artist George Catlin to take a “Fashionable Tour” of this sightseer’s paradise. Worldwide fame was achieved also by Henry Wadsworth Longfellow’s 1854 poem “The Song of Hiawatha.” The poem was a high-selling epic based on various Native American legends, which demonstrated their relationship with the nature and offered anglo readers a sympathetic view of tribes. The area was further advertised with early paintings by artists including George F. Fuller (b. 1822). From this promotion, tours of the Mississippi were sought after. Tourist artists came from the east, wishing to see firsthand the wild, romantic west. Some residents of Wisconsin made summer painting trips to Minnesota. Tourist artists visited Minnesota in the 1860s and 1870s, most of them being landscape artists. Hailing from Minnesota, it comes with pride to announce that Minnehaha Falls was actually the favored subject for nineteenth-century American landscapist painters (see figs. 1-2). Figure 1. Robert Scott Duncanson (1821-72), The Falls of Minnehaha, 1862, oil on canvas, 24 inches x 29 inches, courtesy of Richard Green Fine Paintings. Figure 2. Albert Bierstadt (1830-1902), Minnehaha Falls, c. mid-to-late nineteenth century, oil on canvas, 42.6 inches x 53 inches, courtesy of the Chrysler Museum of Art. Including landscape points like Minnehaha Falls, and Native Indian cultures, the frontier was viewed as both romantic and dramatic. 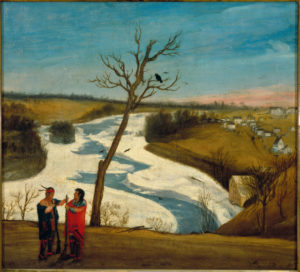 Second in popularity to depictions of Minnehaha were St. Anthony Falls (see fig. 3) and Lake Pepin in Minnesota. During the period, artists were concerned with light for its scientific and aesthetic properties. American landscape painting of the nineteenth century was luminist in it’s poetic, naturalistic style and concern with light. Figure 3. 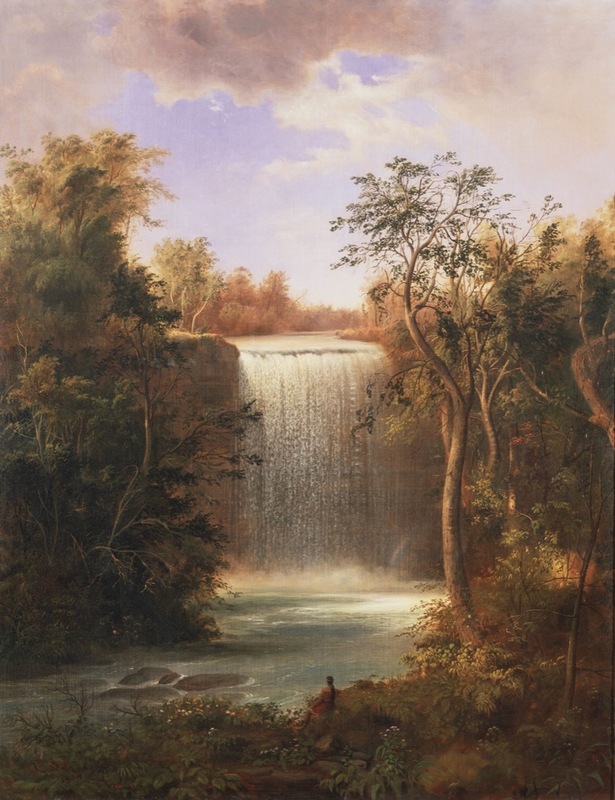 Seth Eastman (1808-1875), The Falls of St. Anthony, 1848, oil on panel, courtesy of Minneapolis Institute of Art. 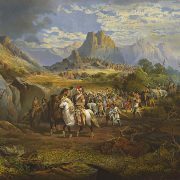 Following communal settlement, the mystery of the pioneer west disappeared, encouraging artists to turn from landscapes to portraits and candid paintings portraying landscapes. Itinerant limner artists were those that travelled, painting portraits to earn their livings through free food and lodging in sitter’s homes. These artist remain largely unknown, because they did not sign the portraits. With the advent of great settlement in the 1850s, the allure of painting Native Indian’s portraits began to wane. New homes were in need of decor and churches established in the state required the creation of religious art, for which they usually commissioned sculpture. Figure 4. 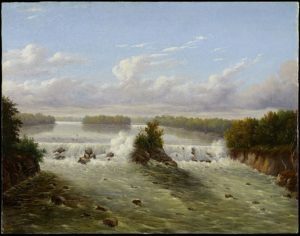 Junius Sloan (1827 – 1900), St. Anthony Falls, 1852, oil on canvas, 17 inches x 19 inches, Minnesota Historical Society. Some of the settled artists never received formal training; this group was mainly composed of women simply because they could not afford to become traveling artists. The painting style shifted from representative to decorative, with many untrained artists creating flat compositions that displayed stronger pattern and balance than that of perspective (see fig. 4). The untrained settler artists, as well as professional touring artists, depicted landscapes of the Mississippi River and the towns along its course, for instance, the flat-topped hills of Winona. 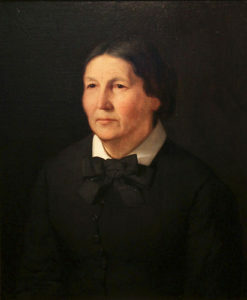 In the early years of Minnesota statehood, there were also professional artist residents that received formal art training in their country of origin. Soon enough, art by settlers began to more directly reflect the styles of their European backgrounds and training. At large, even trained artists were fruitless in maintaining steady incomes and in creating a Minnesota art school. To ensure income, many artists sacrificed their love of painting only landscapes with painting portraits (see figs. 5-6). Some artists that resided in Minnesota found great success. This group includes Herbjørn Gausta (b. 1854), Alexis Jean Fournier (b. 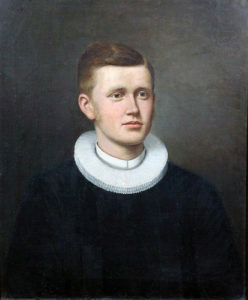 1865), Peter Gui Clausen (b. 1830), Alexander F. Loemans (b. 1816), Anton Gag (b. 1859), Nicholas R. Brewer (b. 1857), Feodor Von Luerzer (b. 1851), and more. Additional artists that generated quality art are largely unrecognized today; these artists will be surveyed in a forthcoming blog. 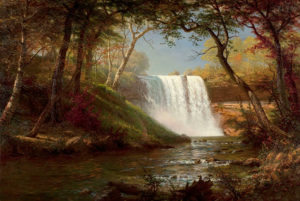 Many artists were drawn to Minnesota in its early statehood via Minnehaha Falls, which became a popular tourist and settlement destination for the Midwest.